Monrovia, Liberia: President George Manneh Weah has called on members of his cabinet and other officials of government to honor their tax obligations as to financially equip Government execute its mandate consistent with the Pro-Poor Agenda for Prosperity and Development. The President reminded government officials about their tax commitments and how this is significant to transforming the nation and the lives of the people of Liberia. President Weah, who made those remarks Monday, December 3, 2018 when toured ongoing government-funded community road projects in and around Monrovia, said he was convinced that government can do more when citizens pay their taxes, and when officials of government lead by example by meeting their tax obligations. President Weah warned officials of government to always be on the side of the law by paying their taxes regularly or he would be compelled to take the appropriate action. He said another reasonable way to ensure tax compliance of his officials and government workers is to effectuate the deduction of taxes owed from the salaries of delinquent individuals. 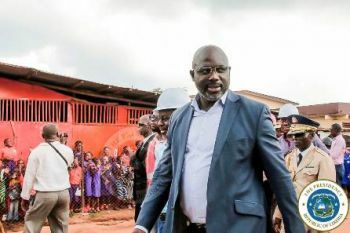 President Weah and his administration have initiated dozens of community projects, principally the construction of paved roads, which are largely funded from government’s meager domestic revenues. According to the Liberian leader, officials of government must lead by example by paying their taxes. This, he said, will encourage ordinary citizens to also honor their tax obligations. He however urged Liberians not to relent in paying their taxes without which he said the government cannot carry on development. President Weah expressed appreciation with the progress contractors are making to meet deadline for the completion of the projects. The President particularly acknowledged the significance of the Doe Community and Clara Town road to the residents, describing it as milestone achievements. Monday’s daylong tour which is a continuation of his vigorous road inspection promise took the President to the Chucky, Pipeline-Johnsonville project, Patience Shop-Bardnersville road, Doe Community-Clara Town and the Sawmill Community road projects. He also inspected New Kru Town Costal Defense project.